The ironic thing about living in space is that you spend all of your time crammed into a tiny tin can. So the brave men and women at the International Space Station are probably stoked about what’s headed their way next month: a spare room. 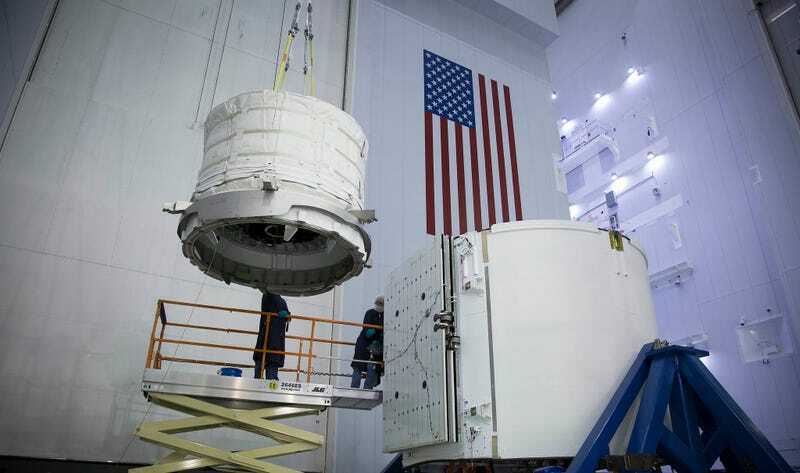 The Bigelow Expandable Activity Module (BEAM) is a twelve foot long, expandable habitat that’ll remain tethered to the ISS for the next two years. SpaceX, which has the honor of flying BEAM into orbit in April, recently posted a badass photo of the hab being lowered into a Dragon cargo capsule. It doesn’t get much more futuristic than this marriage of commercial spaceflight and expandable space habitats. Come to think of it, I’m pretty sure that’s a plot point in Neal Stephenson’s latest science fiction novel.